In my collection I do have several of these but I never saw so far one like this where the Jewish mandatory middle name SARA is STAMPED. 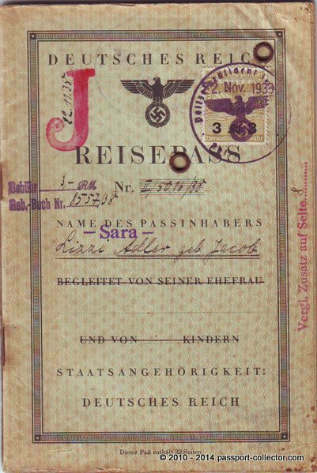 The Nazis made it mandatory to Jews to “re-register” their passports so that they can add the infamous big red “J” and the middle name “Sara” or “Israel” to mark then clearly as Jews! This procedure was never described in detail by the Nazis, only the size of the “J” was defined with 3 cm and the location where to stamp in the passport. The form of the “J” and how to add the Jewish middle names were not defined. That’s why you can find various forms of the “J” marking, even a painted letter was possible and is documented. However, a stamped Jewish middle name “Sarah” I never saw before. We can assume that there will be then also stamped names of “Israel”.